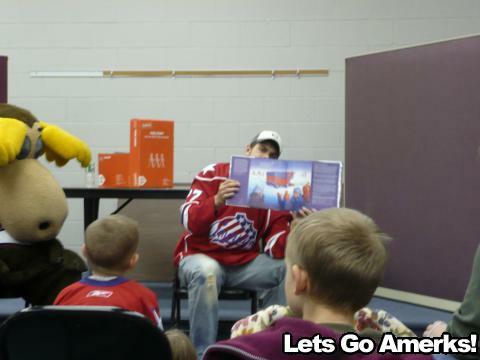 Reading Power Play a Hit · Let's Go Amerks! Patrick Kaleta made an appearance tonight at theÂ Ogden Farmer’s LibraryÂ for the “Reading Power Play” series being put on by the Rochester Americans and the Monroe County Libraries. After reading Z Is For Zamboni: A Hockey Alphabet, Kaleta showed off some Amerks’ hockey equipment with some volunteers and then he and the Moose signed some autographs. There wereÂ trivia questions for a chance to win Amerks’ prizes, with questions geared towards the younger kids and older kids alike.Â Free tickets to the December 7th game against the Toronto Marlies were given to every child tonight. There are plenty of other chances to see your Rochester American players at a local library.Â Tomorrow afternoon, you can catch David Brine at the Lincoln Branch Library. And don’t forget about the â€œGo-Kart Challengeâ€ at Inside Track Speedway on Saturday night (November 17th) from 5:00-8:00PM.Â Here people can race their favorite players in go-kart races for $6 a race.Â Portions of the proceeds will go to AIDS Rochester. At the go-kart races, there will be silent auctions for used Amerks’ gear all to benefit AIDS Rochester.Â Don’t miss out on the fun.